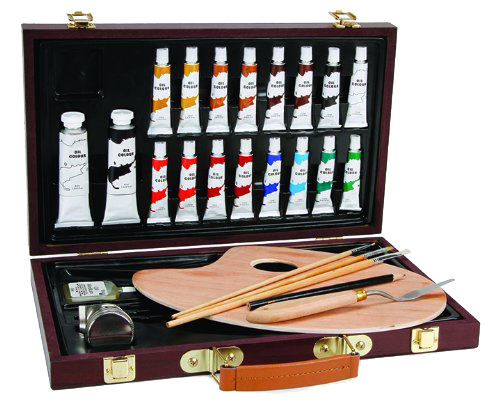 The perfect acrylic travel companion with 6 colors and 5 short handled brushes. 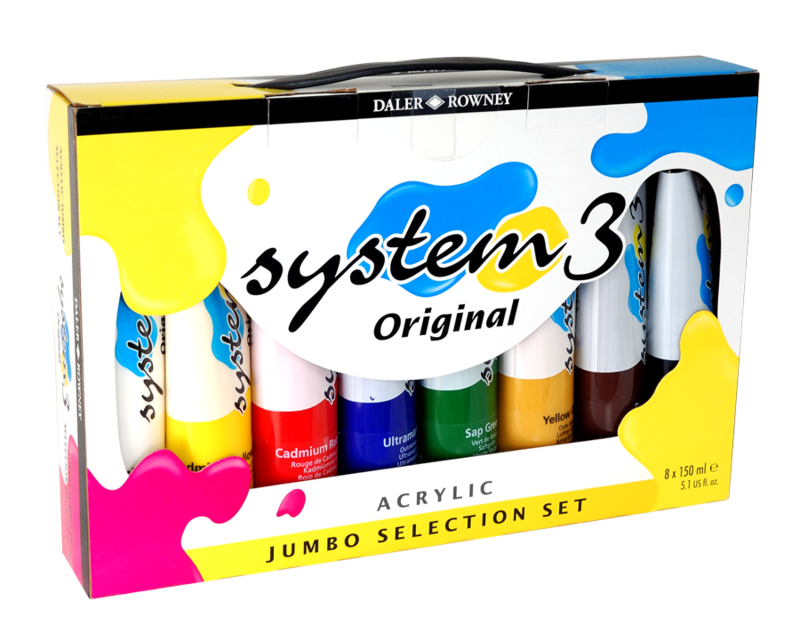 System 3 Original is a high quality, flow-formula, water-based acrylic paint which offers an excellent painting experience. It offers excellent light-fastness, permanence, durability and covering power. 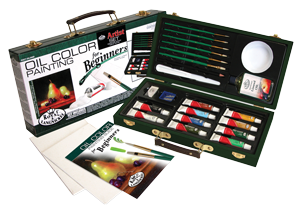 System 3 brushes are resilient and durable - an ideal art & craft painting tool for beginners and enthusiasts alike. Limit 2 per customer. Contents can vary slightly but will always be of equal or greater value. This fantastic set comes to you exclusively from Rex Art. 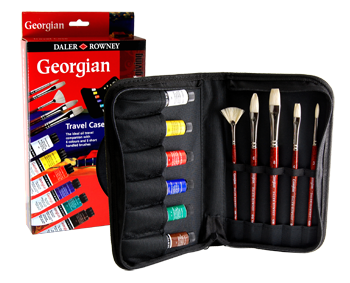 We've put together 5 great Richeson brushes of assorted bristles, shapes and sizes at an amazing price. You'll love the quality of these brushes. 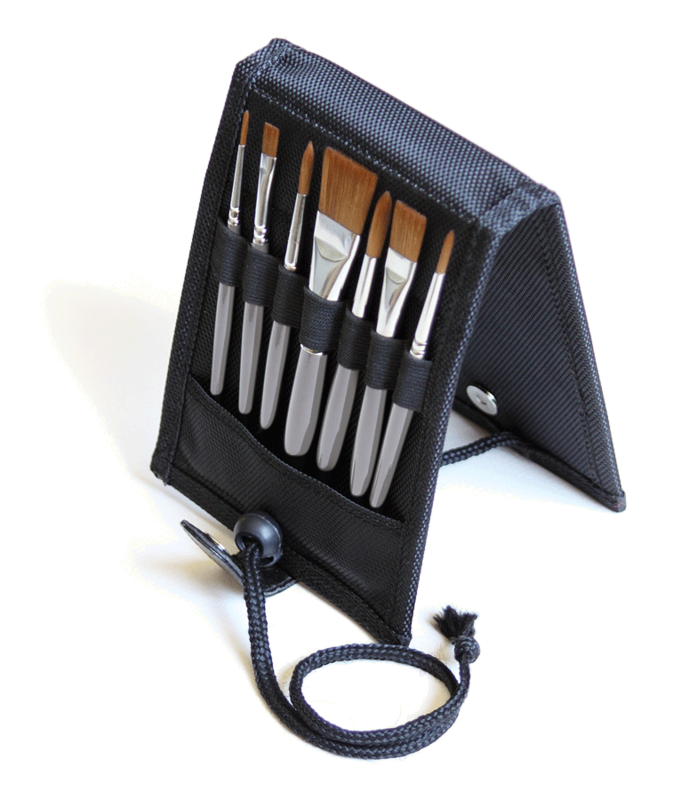 Plus, we've packaged them in a bamboo brush mat, which is great for transporting your brushes, while giving them enough airflow to preserve their longevity. Made with fine grade bristle with excellent flagging. The head shapes are designed to give the maximum life to the brush.The ferrules are a beautiful, highly polished Copper Nickel. The handles have excellent balance, are designed to reduce fatigue, and have a soft matte finish that feels great on your hands. The latest wonder of hi-tech brush making. A filament so good it will pass for sable. This new fiber feels and responds like sable. Even loaded with paint it will come to a razor edge in the bright. The round is stout and comes to a strong firm point. Because of their softness, this series is ideal for glazing. 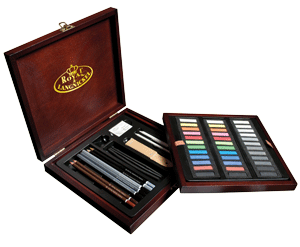 The handles also features a soft matte finish that gives the brushes a luxurious feel. 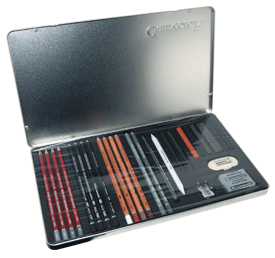 This brush set will provide you with the workhorses you need every day. 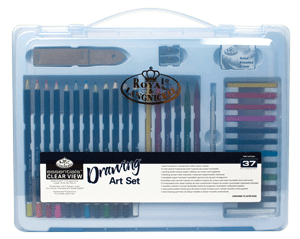 This Daler-Rowney System 3 Acrylic Jumbo set will make any artist happy. Eight huge 150ml tubes in the perfect mixing colors are sure to please. 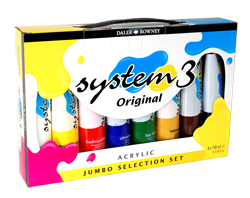 System 3 is a high quality, flow-formula, water-based acrylic paint that offers an excellent painting experience. It has excellent light-fastness, permanence, durability and covering power. 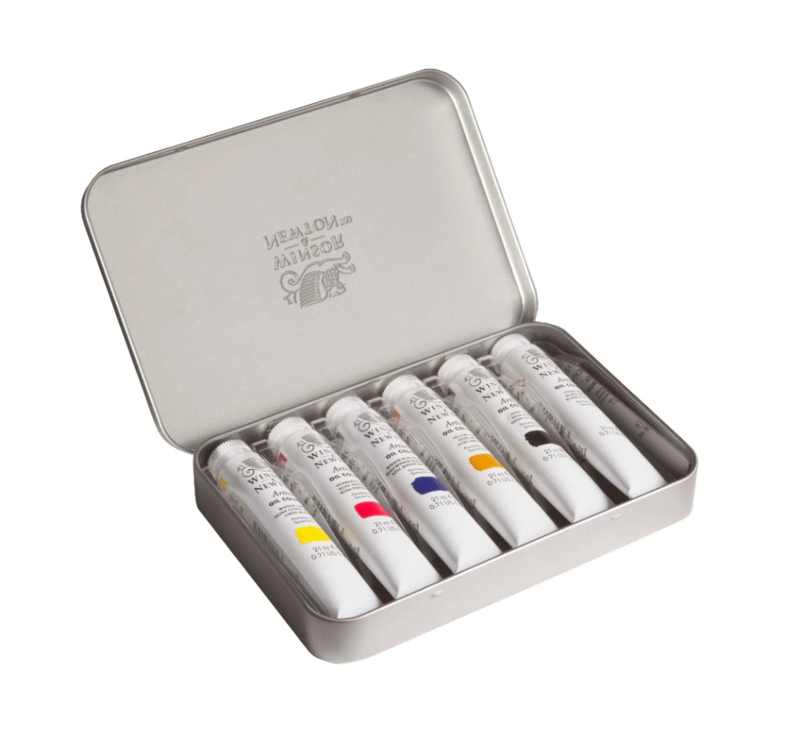 All colors can be thinned with water to create pale washes or used directly from the tube. 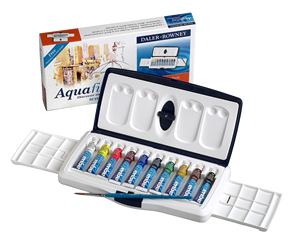 In either form, the color dries quickly to create an insoluble film. The quick drying properties of the range enable the artist to work quickly, placing colors over each other or side by side without any problem. 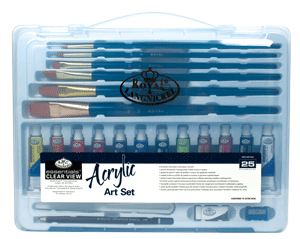 Acrylic mediums can also be added to extend the creative possibilities, including screen printing. System 3 has a medium body consistency. It is designed to offer the perfect compromise between firmer, more controlled applications of color and the need to cover large areas swiftly and evenly. 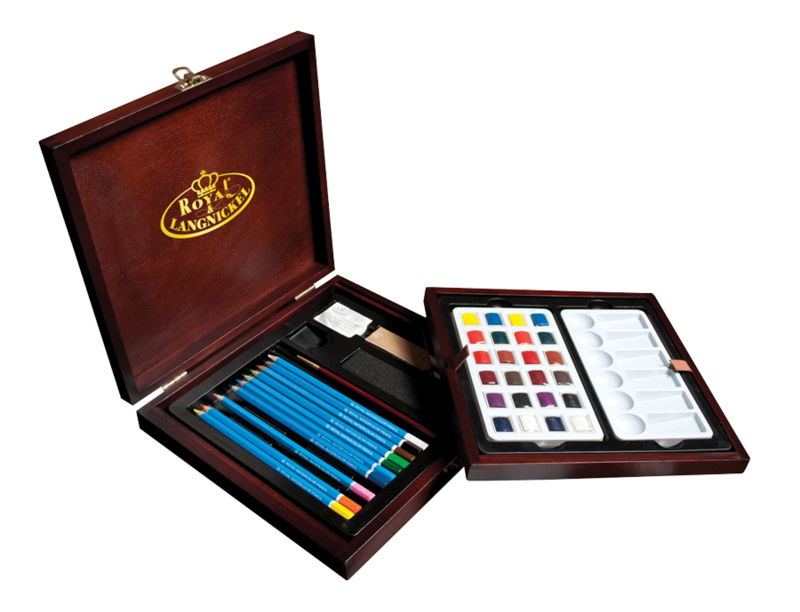 A versatile combination of System 3 acrylic colors, synthetic brushes, acrylic mediums and accessories, beautifully presented in a wooden box. 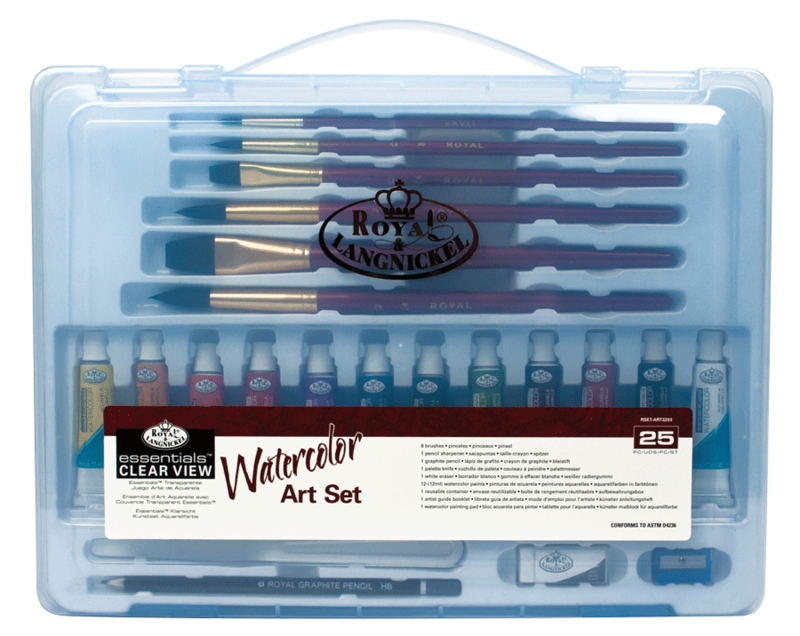 A perfect set for every acrylic artist. 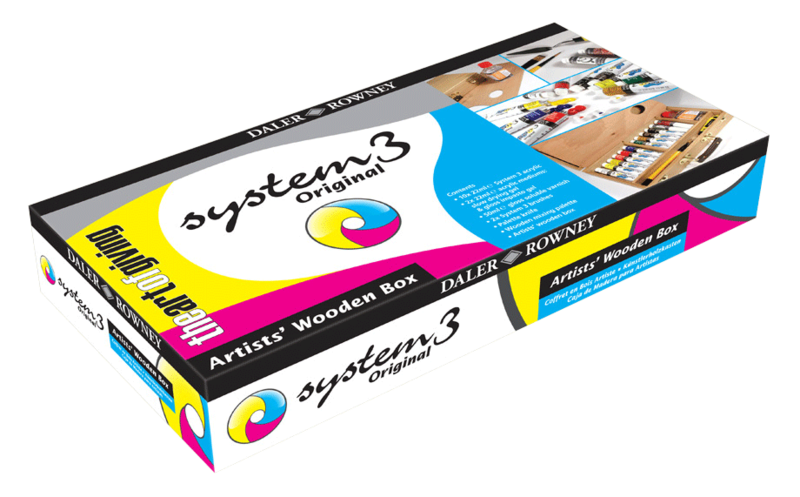 System 3 Original is a high quality, flow-formula, water-based acrylic paint which offers an excellent painting experience at an economical price. It is a comprehensive range which offers excellent light-fastness, permanence, durability and covering power. All colors can be thinned with water to create pale washes or used directly from the pot or tube. 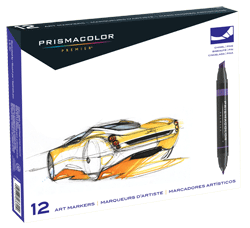 In either form the color dries quickly to create an insoluble film. The quick drying properties of the range enable the artist to work quickly, placing colors over each other or side by side without any problem. 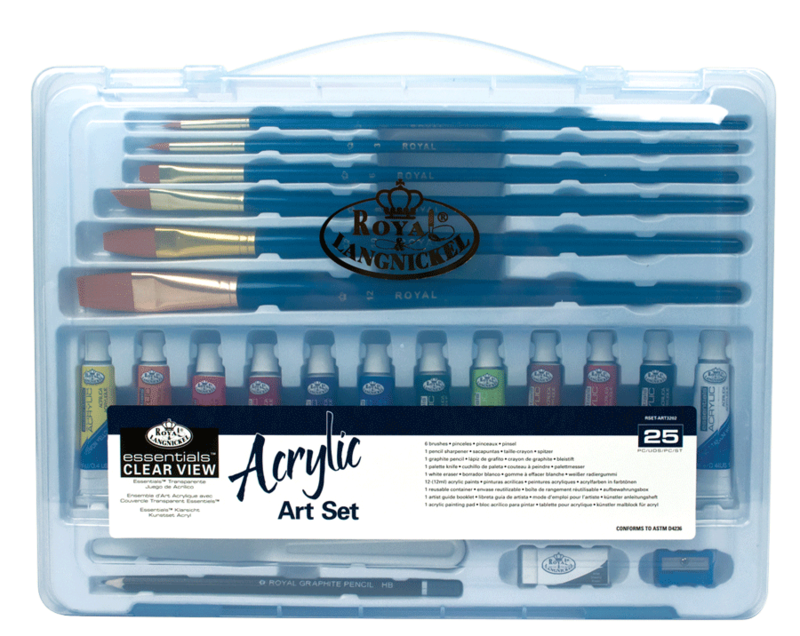 Acrylic mediums can also be added to extend the creative possibilities, including screen printing. 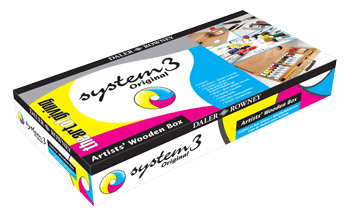 System 3 Original has a medium body consistency. It is designed to offer the perfect compromise between firmer, more controlled applications of color and the need to cover large areas swiftly and evenly. A perfect travel companion for every watercolor artist! 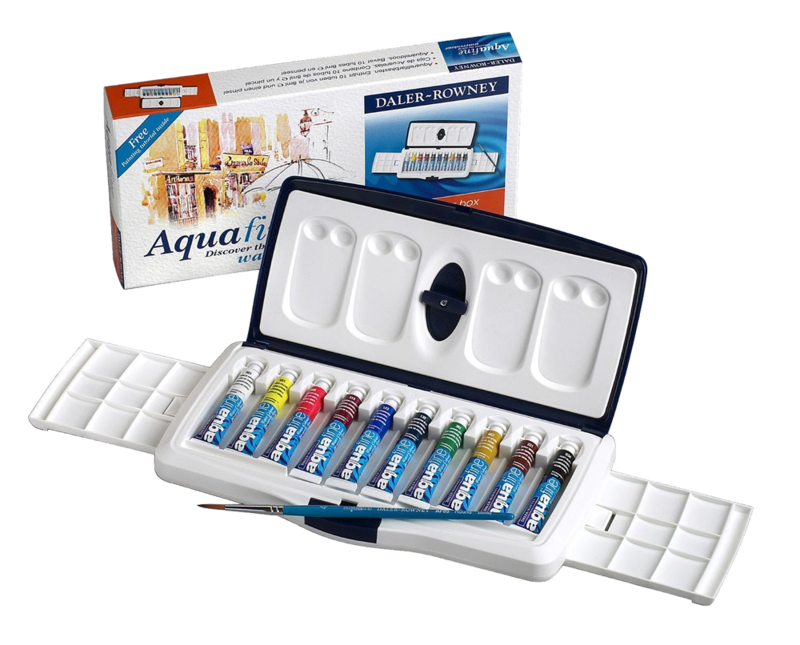 The Aquafine watercolor range has been specially formulated to provide the watercolorist with vibrant, free-flowing transparent colors which can be mixed for endless creative possibilities. 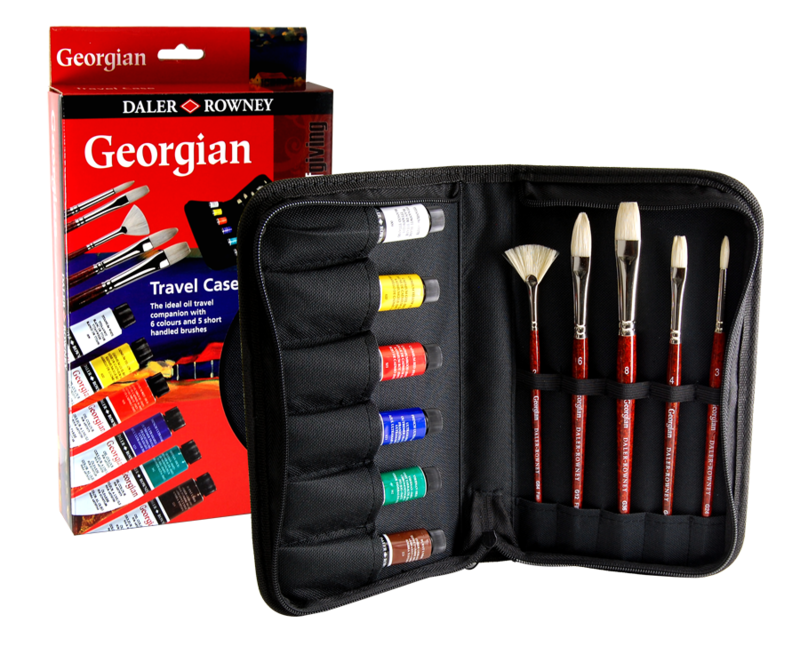 This set is an ideal travel companion of 24 half pan colors and a mini brush, conveniently packaged in a compact case featuring a thumb ring and a detachable palette. 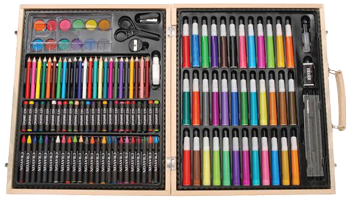 Beginning artists will appreciate this supply-packed, comprehensive set. 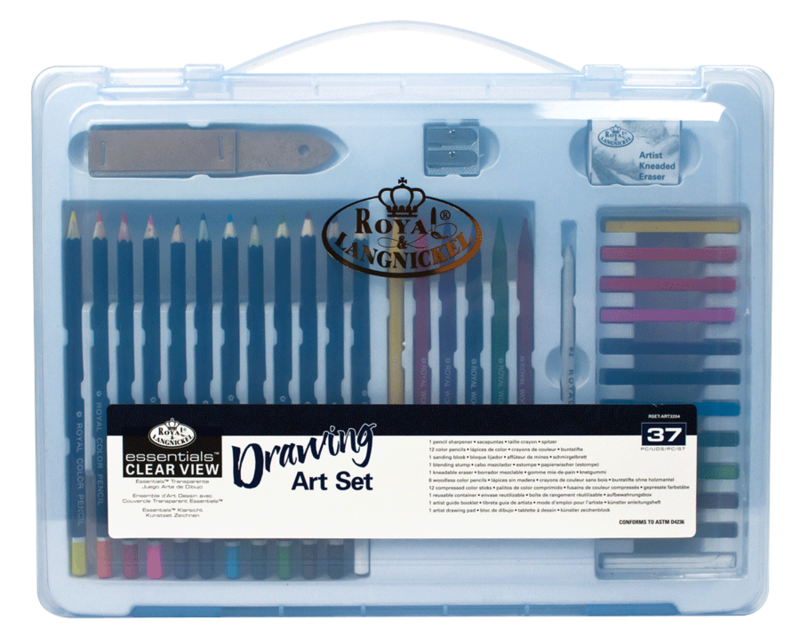 Whether working in colored pencil, oil pastel, watercolor or with a traditional drawing pencil, everything needed is included. 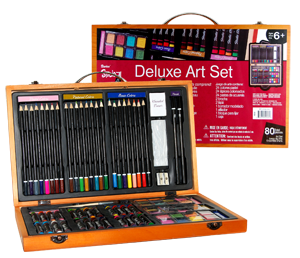 This 131 piece deluxe art set comes with lots of art supplies for drawing, painting and more. 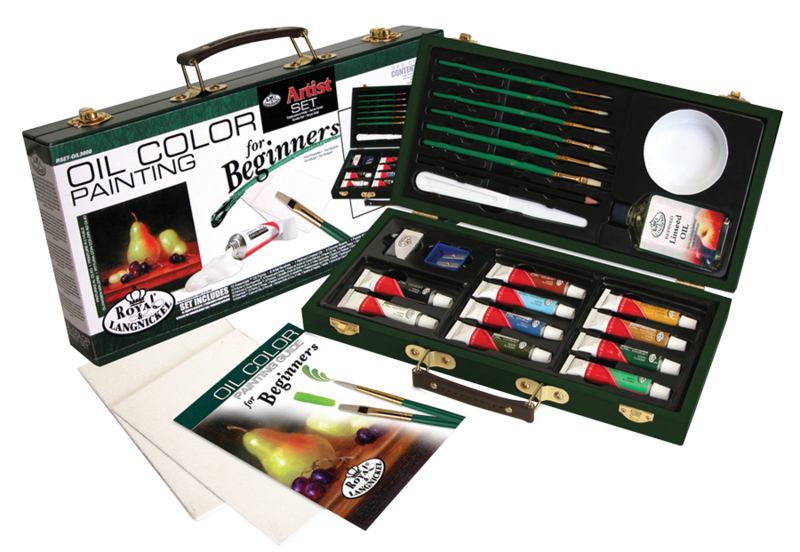 Provides an excellent way for kids and adults to experiment with a variety of artistic media. 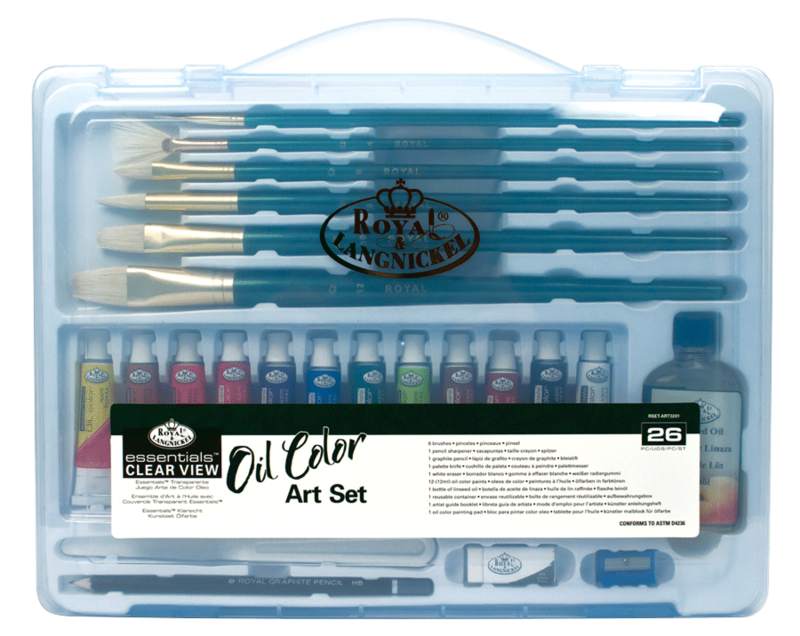 This 27 piece oil painting kit, including a wood box, is a great gift for any budding artistic adult. There are enough materials here to spark that creative impulse and let it shine. 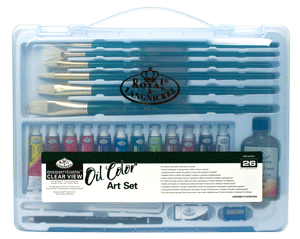 This 27 piece acrylic painting kit, including a wood box, is a great gift for any budding artistic child or adult. There are enough materials here to spark that creative impulse and let it shine. This 27 piece watercolor painting kit, including a wood box, is a great gift for any artistic kid or adult. There are enough materials here to spark that creative impulse and let it shine. 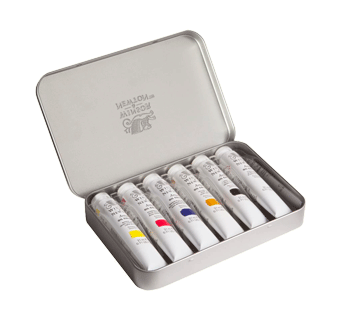 Finally a Plein Air Watercolor Brush set truly designed for travel. This lightweight sets weighs only 5 ounces. 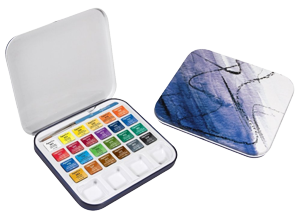 …the perfect mix for painting anything from a postcard to a ¼ sheet. The shorter than traditional handles are designed for ease of close work while sitting in a Deck Chair on a beach or while perched on a rock when hiking! 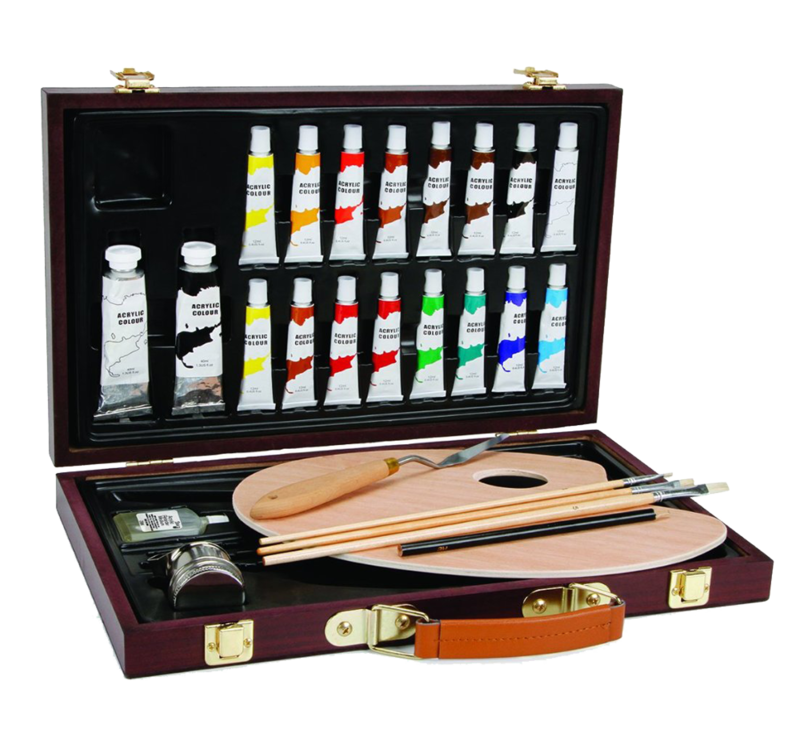 The beautiful case with smooth snap folds over to protect the brushes while traveling and offers a drawstring style pull to allow the case to stand the case with brushes on a table while you work. Expression by Robert Simmons was designed with the needs of Decorative Painters in mind. The unique "balanced handle" offers a comfortable grip while eliminating the fatigue that comes with long hours of painting. Most importantly, the brush itself is composed of a carefully blended mixture of varying thicknesses and types of synthetic filaments resulting in a blend with a smooth, soft feel. This natural sable-like mixture allows for enhanced control in painting by with enough resilience to perform perfectly every time. 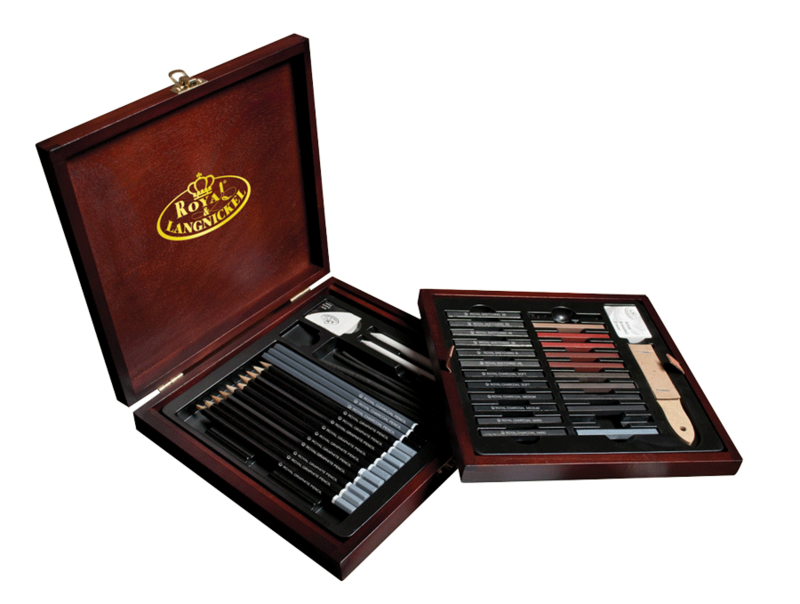 This selection of 8 Expression brushes come in a high quality case that safely keeps the brushes together and features an adjustable interior which allows the brushes to stand when in use. 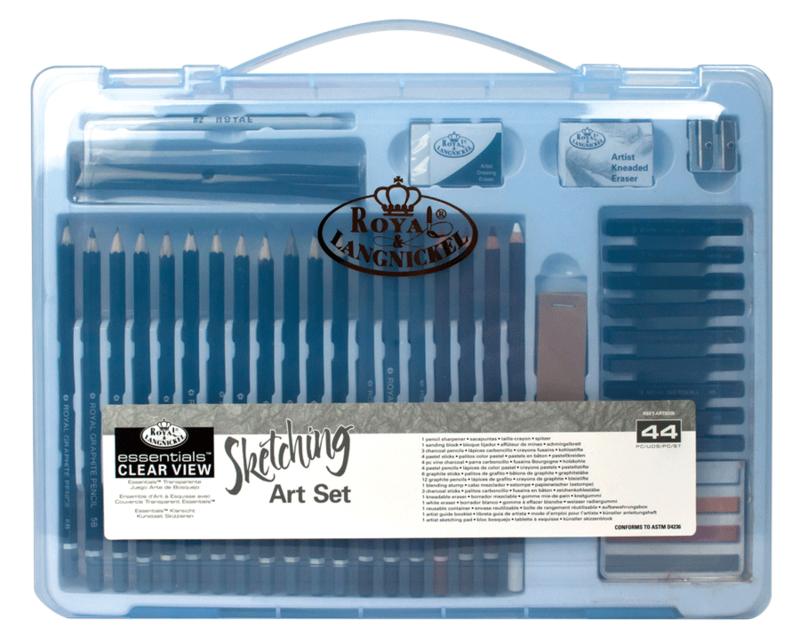 Includes a wide range of traditional drawing materials perfect for doing everything from quick sketches to completed drawings. 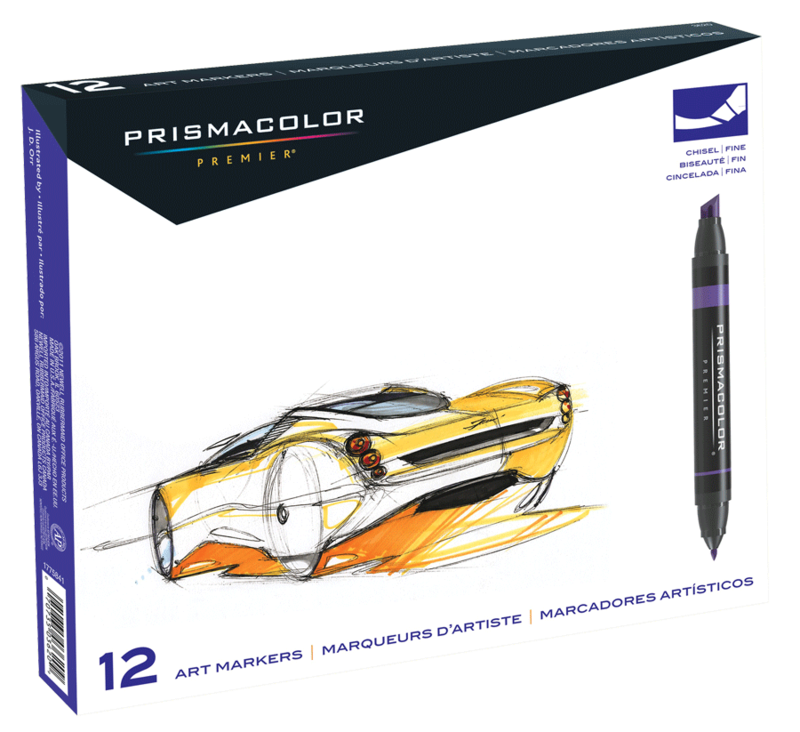 Cretacolor drawing materials are artist quality with full pigmentation and a high lightfastness rating. 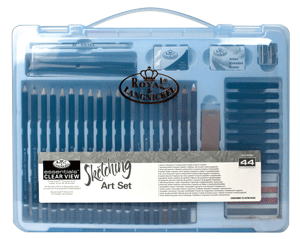 Excellent for blending and mixed media. Cretacolor uses high-grade, fireproof ceramic clay in all of its graphite products. 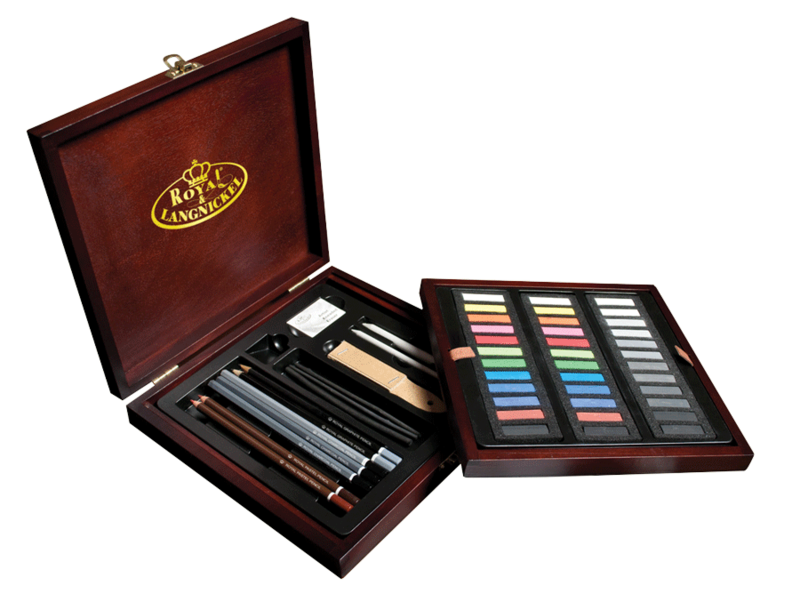 The result is a line of drawing tools with high breaking strength. Different grades are made at one time and are achieved by varying the amount of clay and graphite. 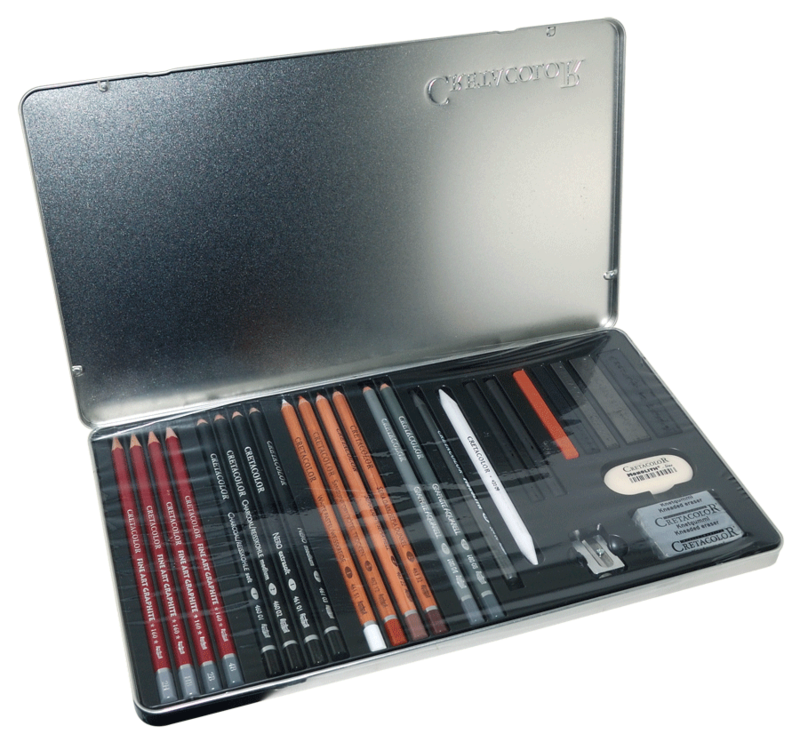 Cretacolor drawing charcoal is produced using a special deep-firing method, resulting in a dense, rich charcoal of great depth. 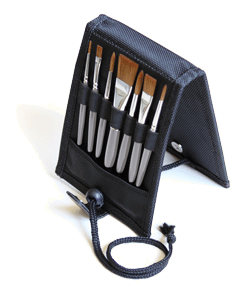 Made from a mixture of clay and charcoal particles, it produces a precise and consistent stroke. 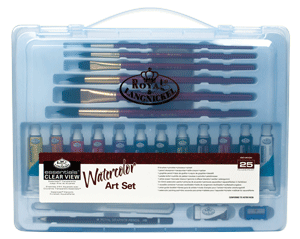 Contains Ten 8ml tubes of Aquafine watercolor paints and a brush. 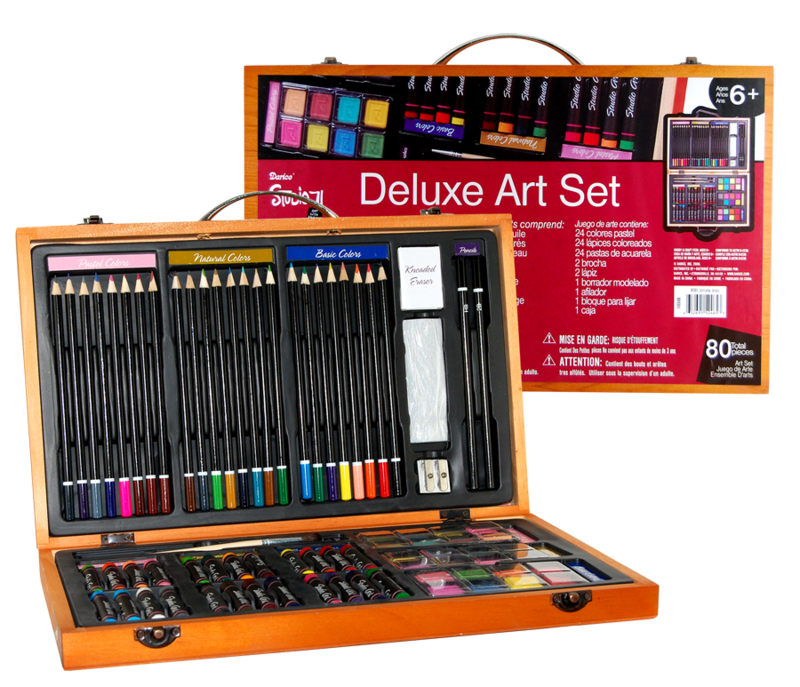 This set includes 12 Assorted Primary & Secondary Prismacolor Markers. 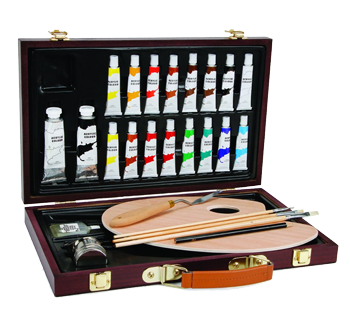 Sable is considered the premium natural fiber for water media brushes. Known for their spring, durability and absorbency, sable brushes hold water superbly and provide a consistent, luxurious brush stroke. 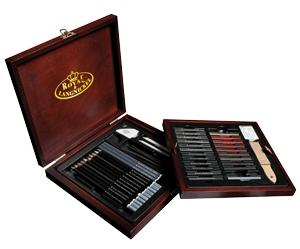 Take this opportunity to get a wonderful set of sable brushes at an exceptional price, only from Rex Art. 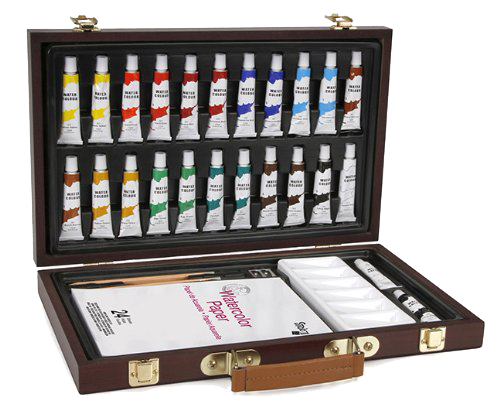 A great way to store and tote your art supplies! Please note contents subject to change. 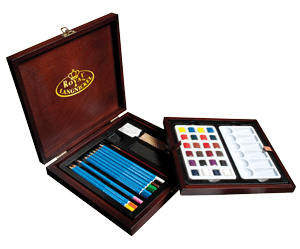 This wood box set is perfect for storing your art supplies in plain view. No need to hide this box - you'll want to show it off! Please note that colors subject to change. 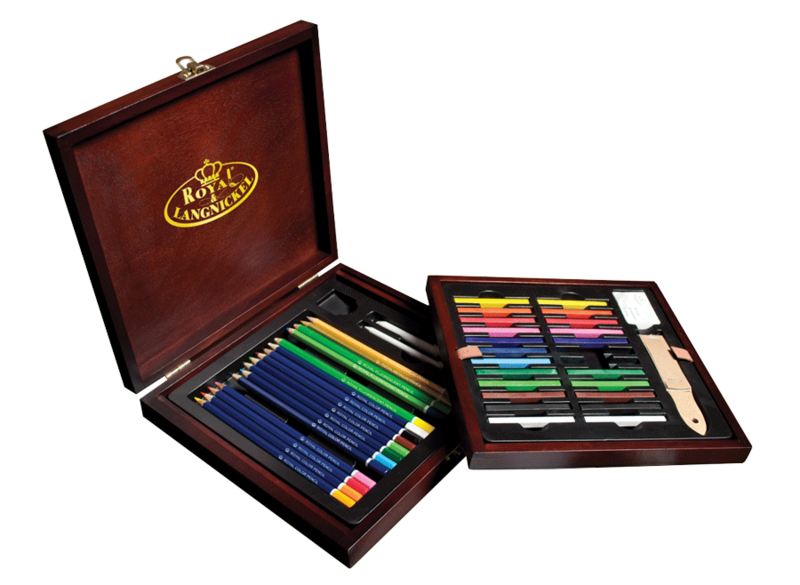 The ultimate gift for a pencil artist. 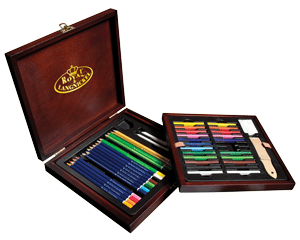 Tons of drawing supplies in a gorgeous wood box. Get ready for some serious gratitude. 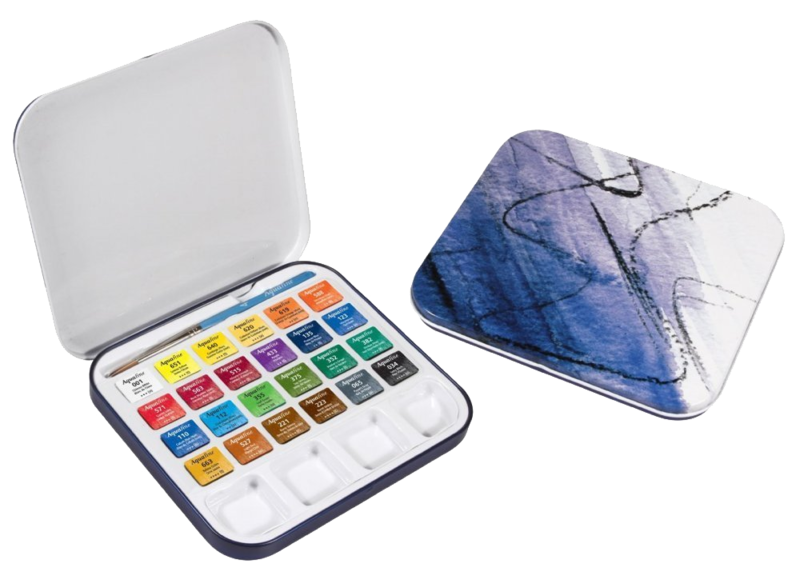 Conveniently packaged in a sleek metal tin, this selection of six 21ml tubes of Winsor & Newton Artists' Oil Color is ideal for on-the-go transport. This set includes 24 Prismacolor Pencils in a metal tin.